An update to Vol. 1, pp. 93–102. Subsequent to preparatory work for the laying of railroad tracks for a line between Ashdod and Ashkelon, a salvage excavation was conducted by the Israel Antiquities Authority near Tel Ashdod. The first season took place in November 2003–January 2004, under the direction of E. Kogan-Zehavi, and the second in April–June 2004, under the direction of E. Kogan-Zehavi and P. Nahshoni. Other small-scale excavations were conducted by D. Varga in 2003, in an arched tomb from stratum 2, a cist tomb from stratum 7, and a furnace from stratum 3. The excavation area is located some 200 m northwest of Tel Ashdod, and as based on previous knowledge, outside the area of the mound. 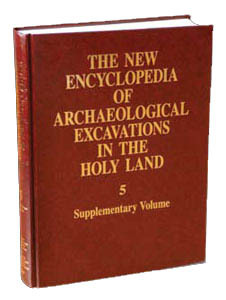 Four excavation areas (A, B, C, D) were opened during the excavation, yielding archaeological remains from five periods—the Iron Age and the Persian, Hellenistic, Late Roman, and Byzantine periods—described below from the earliest to the latest. The prominent remains from the excavation are basement rooms and a bathing room of an Assyrian-style palace, which once spread over an area of at least 2.5 a.
STRATUM 7. The Assyrian-style palace of stratum 7 stands atop a monumental platform rising to a height of c. 3 m and built of red square mud bricks (38 by 38 by 10 cm). The shape of the bricks is typically Mesopotamian, as opposed to the rectangular bricks prevalent at Tel Ashdod. The palace itself is also built of square bricks, gray in color rather than red.